2011-04-27: If you're having problems embedding the fonts, I've fixed them so they should work now. Please download them again and replace the old version. The "fstype" metadata wasn't set properly by my ancient font editor. Fixed using TTFPATCH. 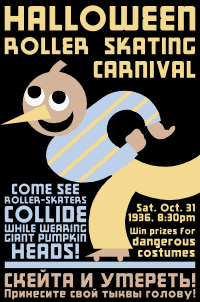 Halloween Roller is based on the title text of a WPA poster for a roller-skating carnival held in NYC's Central Park on Halloween, 1936 (mimicked on the right). Most characters are very angular with only slight curves on the normally rounded parts, except for the "O" and related characters which are incongruently perfect circles. Includes lowercase and Cyrillic. 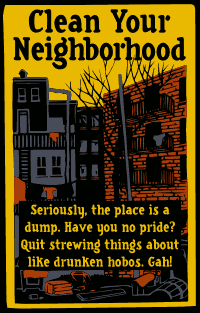 Clean Your Neighborhood is based on the main text from a WPA poster issued in 1937 by the NYC Tenement House Dept., which read: "Help your neighborhood by keeping your premises clean". It's a loose serif that works for both titles and body text. The letters in the original were a bit more irregular; I've evened the widths out a bit to keep it from being too fonty, while hopefully keeping the essential quirkiness. Includes Cyrillic and Greek. Slow Down Girls! is based on title text used through most of 1934 in the Lincoln Star's ill­ust­rated Sunday Magazine (copyrighted by Ledger Syndicates). The font name comes from the title of an Aug. 12 article which advised girls wishing to live longer that "jazz dancing and wild beach activities will shorten your lives." There were dozens of article titles I could have used for a name — including "Curse of Tahiti Proves Fatal", "Are Kid Hoboes A Menace? ", and "Are Reno Divorces Legal?" — but this one seemed the pithiest. One of the article's ill­ustrations ("DON'T tire yourself out with strenuous beach games") is included for your amusement. Font is all caps with alternate forms in the lowercase. Greensboro is a version of a general style of type — characterized by boxy, rectangular letters with sharp curves (except the capital A, which often has a very rounded top) and capital Rs with a jutting, angular tail — many variations of which were commonly used in the US throughout the 1930s-40s. This particular example came from a WPA poster announcing an open house at the Federal Art Center in Greensboro, NC (hence the name). Font includes upper/lower case, accented characters, Cyrillic, and Greek. As seen on the Yeti-Sasquatch Transpacific Brotherhood emblem. 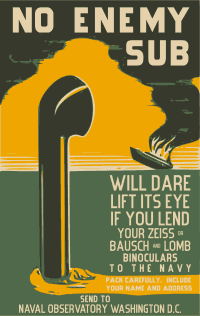 Enemy Sub is based on the text from a WWII poster (recreated to the right using the fonts). It's a plain sans-serif, but the subtle incorrectness in the curves and angles give it a hand-drawn poster look without being too obviously fonty. It comes in two weights: regular and thin. Both are proper small caps, with the two sizes drawn to uniform thickness, not merely scaled. Includes accented characters, Cyrillic, and a few word characters ("at", "and", etc.). As seen on the Tree Octopus poster. 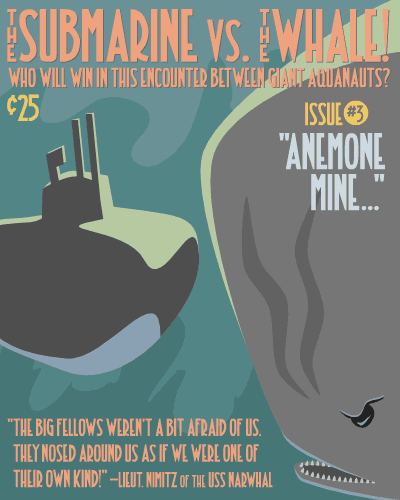 Submarine vs. Whale is an Art-Nouveau-era font based on the heading of a 1911 illustrated account of Lieutenant Chester W. Nimitz's encounter with whales while commanding the USS Narwhal. It's cleaner than the original, but still has some irregularity in the curves to give it character. Great for tales of underwater Edwardian adventure!